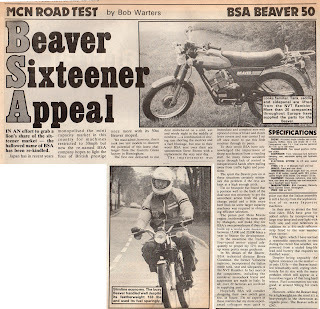 My Motorcycle Restoration Diary & Notes: BSA Beaver 50 - Motorcycle News Road Test. 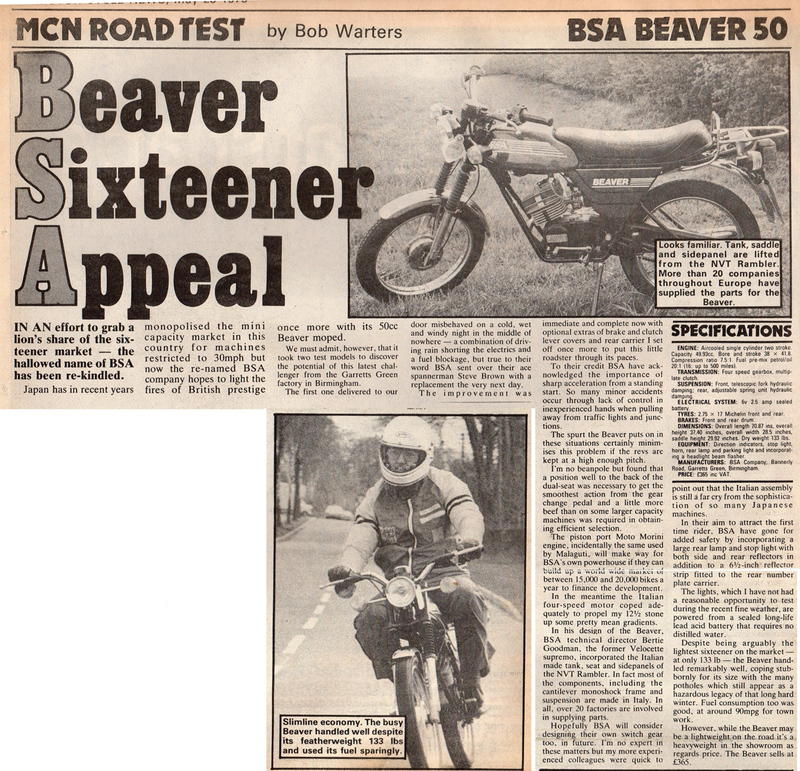 BSA Beaver 50 - Motorcycle News Road Test. IN AN effort to grab a lion’s share of the sixteener market - the hallowed name of BSA has been rekindled. Japan has in recent years monopolised the mini capacity market in this country for machines restricted to 30mph but now the re-named BSA company hopes to light the fires of British prestige once more with its 50cc Beaver moped. We must admit, however, that it took two test models to discover the potential of this latest challenger from the Garretts Green factory in Birmingham. The first one delivered to our door misbehaved on a cold, wet and windy night in the middle of nowhere - a combination of driving rain shorting the electrics and a fuel blockage, but true to their word BSA sent over their ace spannerman Steve Brown with a replacement the very next day. The improvement was immediate and complete now with optional extras of brake and clutch lever covers and rear carrier I set off once more to put this little roadster through its paces. To their credit BSA have acknowledged the importance of sharp acceleration from a standing start. So many minor accidents occur through lack of control in inexperienced hands when pulling away from traffic lights and junctions. The spurt the Beaver puts on in these situations certainly minimises this problem if the revs are kept at a high enough pitch. I`m no beanpole but found that a position well to the back of the dual·seat was necessary to get the smoothest action from the gear change pedal and a little more beef than on some larger capacity machines was required in obtain- ing efficient selection. The piston port Moto Morini engine, incidentally the same used by Malaguti, will make way for BSA`s own powerhouse if they can build up a world wide market of between 15,000 and 20,000 bikes a year to finance the development. In the meantime the Italian four-speed motor coped adequately to propel my 12 1/2 stone up some pretty mean gradients. In his design of the Beaver, BSA technical director Bertie Goodman, the former Velocette supremo, incorporated the Italian made tank, seat and sidepanels of the NVT Rambler. ln fact most of the components, including the cantilever monoshock frame and suspension are made in Italy. In all, over 20 factories are involved in supplying parts. Hopefully BSA will consider designing their own switch gear too, in future. I'm no expert in these matters but my more experienced colleagues were quick to point out that the Italian assembly is still a far cry from the sophistication of so many Japanese machines. ln their aim to attract the first time rider, BSA have gone for added safety by incorporating a large rear lamp and stop light with both side and rear reflectors in addition to a 6 1/2 inch reflector strip fitted to the rear number plate carrier. The lights, which l have not had a reasonable opportunity to test during the recent fine weather, are powered from a sealed long-life lead acid battery that requires no distilled water. Despite being arguably the lightest sixteener on the market - at only 133 lb - the Beaver handled remarkably well, coping stubbornly for its size with the many potholes which still appear as a hazardous legacy of that long hard winter. Fuel consumption too was good, at around 90mpg for town work. 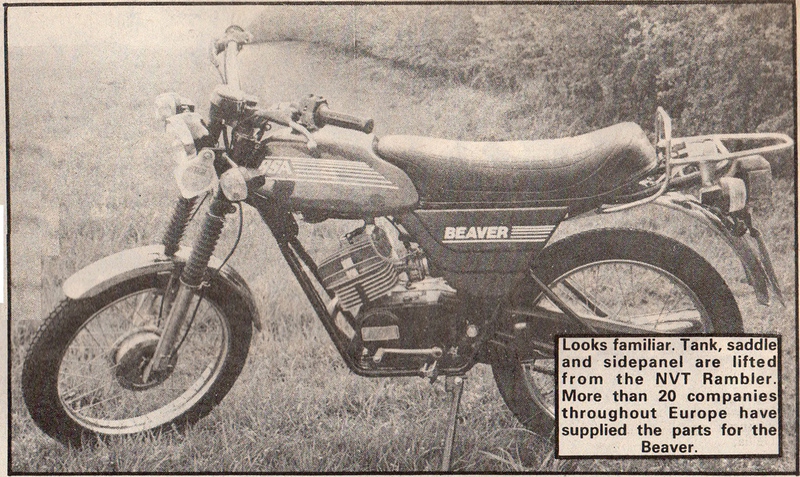 However, while the Beaver may be a lightweight on the road it's a heavyweight in the showroom as regards price. 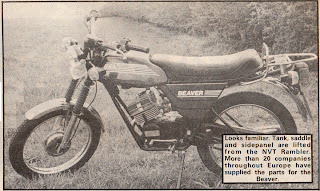 The Beaver sells at £365. ENGINE: Aircooled single cylinder two stroke. Capacity 49.93cc. Bore and stroke 38 x 41,8. Compression ratio 7.5:1. Fuel pre-mix petrol/oil 20:1 (16:1 up to 500 miles). TRANSMISSION: Four speed gearbox, multi-plate clutch. SUSPENSION: Front, telescopic fork hydraulic damping; rear, adiustable spring unit hydraulic damping. ELECTRICAL SYSTEM: 6v 2.5 amp sealed battery. TYRES: 2.75 x 17 Michelin front and rear. BRAKES: Front and rear drum. DIMENSIONS: Overall length 70.87 ins, overall height 37.40 inches, overall width 28.5 inches, saddle height 29.92 inches. Dry weight 133 lbs. EQUIPMENT: Direction indicators, stop light, horn, rear lamp and parking light and incorporating a headlight beam flasher. MANUFACTURERS: BSA Company, Bannerly Road, Garretts Green, Birmingham.